The Government of B.C. is providing $2.6 million in B.C. Air Access Program funding to support improvements at Kamloops Airport, announced Minister of Transportaion and Infastructure Todd Stone. With the support of B.C. Access funds, the Kamloops Airport will rehabilitate a section of the airport apron, or the area where aircraft park to unload and refuel. The apron can get congested, which has the potential to delay the movement of aircraft during peak periods. This project will ensure the safe and efficient manoeuvring of all air traffic, as well as vehicles and personnel servicing aircraft.
" We are incredibly pleased to expand the apron at Kamloops Airport. It will allow the airport to safely handle more and larger aircraft while providing them easier access to our on-site amenities," said Fred Legace, Kamloops Airport Managing Director. " This aligned with our improvements, most recently the runway rehabilitaion, that paired with our growing tourism product, position the airport for growth with our airline partners." 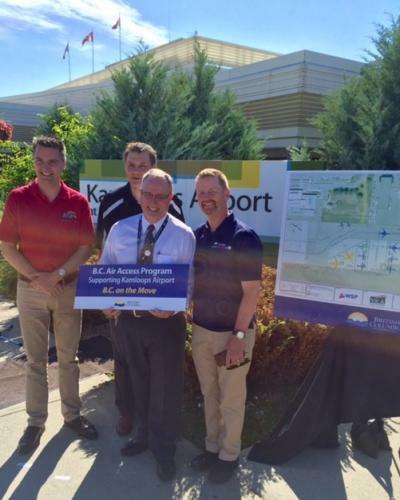 " The Kamloops Airport is busy, critical hub in the region and it continues to see an increaase in year-over-year growth making it a vital link in the region," said MLA for Kamloops-North Thompson Terry Lake. " This investment will allow it to expand and make safety improvements to accomadate the increase in air traffic, allowing it to better serve the community."